C. Venae cordisminimae (Thebesian veins). It’s the principal vein of the heart. 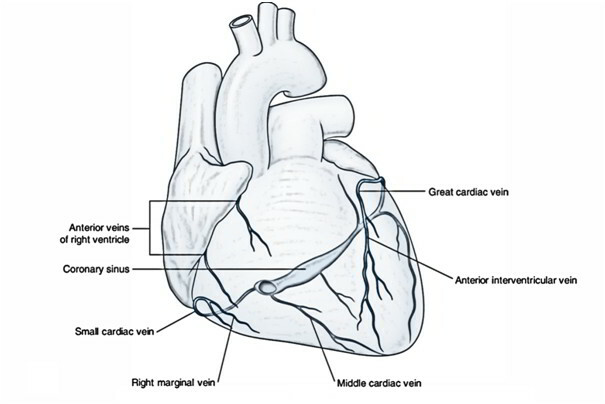 The majority of the venous blood from the walls of the heart is drained into the right atrium via coronary sinus. The coronary sinus is the largest vein of the heart and is located in the posterior part of the atrioventricular groove (left posterior coronary sulcus). It develops from the left horn of the sinus venosus and a part of the left common cardinal vein. A. Great cardiac vein: It accompanies anterior interventricular and circumflex arteries to join the left end of the coronary sinus. B. Middle cardiac vein: It accompanies the posterior interventricular artery and joins the coronary sinus near its termination. C. Small cardiac vein: It accompanies the right ventricular artery in the right posterior coronary sulcus and the right end of the coronary sinus. D. Posterior vein of the left ventricle: It runs on the diaphragmatic surface of the left ventricle and joins the sinus to the left of the middle cardiac vein. E. Oblique vein of the left atrium (Vein of Marshall): It’s a small vein which runs downwards on the posterior surface of the left atrium to goes into the left end of the coronary sinus. It develops from the left common cardinal vein (duct of Cuvier). F. Right marginal vein: It accompanies the marginal branch of the right coronary artery and joins the small cardiac vein or drains directly into the right atrium. G. Left marginal vein: It accompanies the marginal branch of the left coronary artery and drains into the coronary sinus. These are series of small veins (3 or 4) which run parallel to every other across the surface of right ventricle to open into the right atrium. All these are extremely small veins in the walls of all the 4 chambers of the heart. They open directly into the respective chambers. They’re most numerous in the right atrium. The lymphatics of the heart accompany the coronary arteries, emerge from the fibrous pericardium together with the ascending aorta and pulmonary trunk in the create of 2 trunks. The right trunk drains into brachiocephalic nodes and left trunk drains into tracheobronchial nodes (at the bifurcation of the aorta).